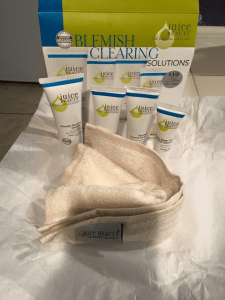 I’m back with part 2 of my review of the Juice Beauty Blemish Clearing Solutions products. If you haven’t already, be sure to check out my initial thoughts on the product here. First let me start by saying that this is solely my opinion and is based on my experience with the product. This does not in any way reflect the opinion of my counterparts at All Frills Beauty. If you can recall from my sample review, the kit comes with the cleanser, blemish serum and oil free moisturizer. The kit also came with the a green apple peel as well as a terry cloth towel to dry your face with. 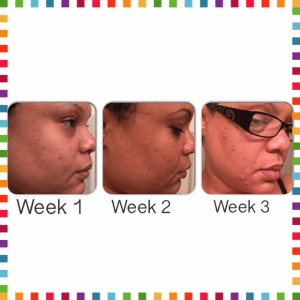 The 30 day supply is supposed to gradually reduce the blemishes and well as acne. Well it did just the opposite for me. It actually made my acne worse than I have ever seen it. After the 3rd week I discarded the product because it was just that bad. I began to develop white heads and very large pimples all over my face particularly in the cheek and nose area. 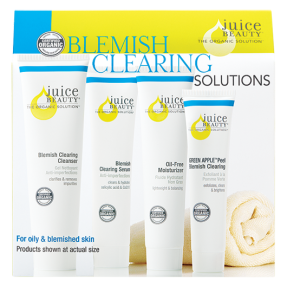 Juice Beauty has a ton of products that may actually work for some but for me the jury is in on the blemish clearing products and the verdict is two thumbs down. Please keep in mind that we all have different types of skin. Personally I have very sensitive combination skin (oily/dry) and I’m very prone break outs if I use the wrong type of products.